Lesson From Jordan To Obama: This Is How It Is Done! Message To ISIS: This Is The "Beginning Of Our Retaliation"
There is a very stark contrast of Barack Obama's actions and reactions to the terror group ISIS beheading Americans and releasing video of it, to how other countries leaders act and react when it is their citizens brutally murdered, locked in a cage and burned alive as shown in a video release by ISIS. The lesson here for Obama is "this is how it is done!" 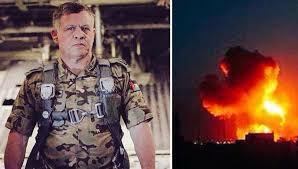 The message to ISIS from Jordan leadership is clearly stated in the video below where Jordan's Foreign Minister Nasser Judeh appeared on CNN’s "The Situation Room" and stated the airstrikes which has killed many ISIS members were only the "beginning of our retaliation." Before watching the video, consider how Barack Obama and his administration handled the beheadings of Americans captured by ISIS. Source- CNN: "President Barack Obama once again refused to label the fight against terrorism as a war on radical Islam or any kind of "religious war," insisting that such labels hurt efforts to root out radical ideologies in Muslim communities." Third and possibility one of the most ridiculous statements made by the obama administration to date, is that people are joining ISIS because "lack job opportunities." Last, but certainly not least, we get to what was reported this morning here at ANP, Obama's most disturbing reaction yet..... let more ISIS members migrate to the US!! In the meantime, within hours after the release of the video showing the Jordanian pilot caged and burned alive, Jordan started executing ISIS prisoners, vowed a "relentless war" on ISIS, and went on an extended bombing campaign, killing 55 ISIS fighters according to reports on February 5, 2015. Last week ISIS beheaded 21 Egyptian Christians, though anyone listening to Obama wouldn't have known they were Christian, he neglected to mention it in his statement and what did Barack Obama do? Just yesterday it was reported that ISIS burned 45 people in the western Iraqi town of al-Baghdadi, near where US Marines are stationed and still, Obama refuses to call these brutal murders by name.